[…] It is now becoming standard practice to make unsubstantiated accusations about racism, sexism, homophobia, white supremacy, etc. to silence disliked, and possibly true, opinions. Christie Blatchford is the latest target of such smear tactics, and this will almost certainly happen again. 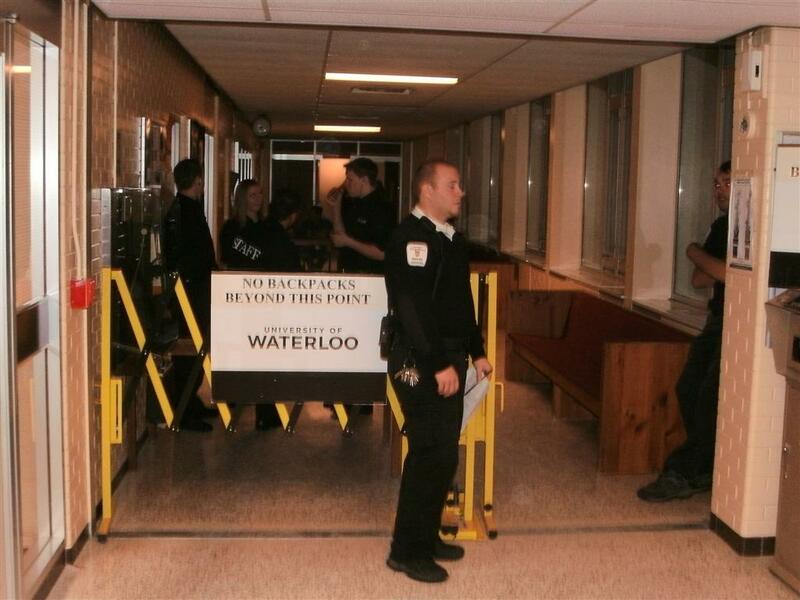 Solidaritists watching the Blatchford affair will be emboldened by the University of Waterloo’s impotence; if these censors are not opposed, we will be effectively asking students to vet who is allowed to speak. […] It is a cruel irony that the student movement, which used to fight for the right to express controversial opinions, is now shutting them down. They are doing this because they have become religious, as opposed to scientific, in their outlook. They believe that they know the truth, and, like a preacher at a pulpit, refuse to listen to the blasphemy of “the Devil”. They have become “defenders of the faith”, and believe, like kindly inquisitors, that those holding views deemed harmful for society should be punished. 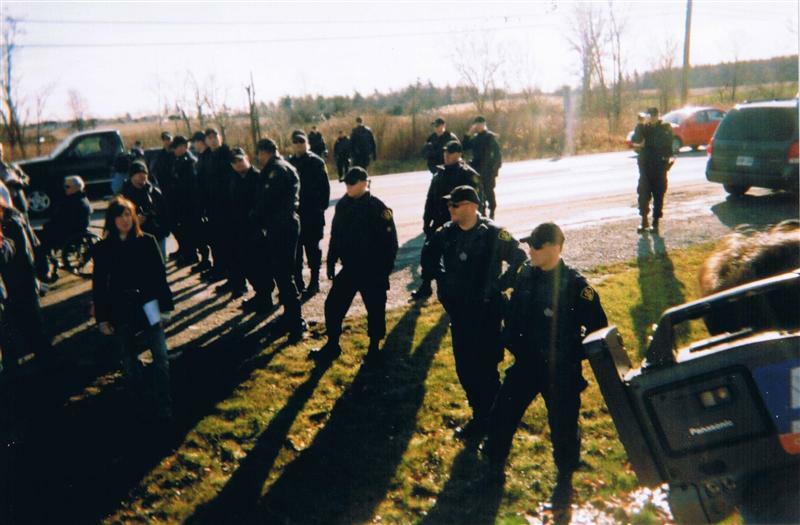 To those of us with years of experience with the OPP’s racialized policing policies in Caledonia, it appeared as though Waterloo was operating from the OPP’s ‘peacekeeping’ playbook whereby police power is used to the detriment of those exercising their rights instead of those threatening them. This appeasement or inaction in the face of unlawful behaviour, and the threat it poses to the rule of law is, of course, the very point of Blatchford’s Helpless. I believe that what organizations do when things run off into the ditch speaks more about their character and commitment to professed values than all their lofty mission statements, ‘core values’ pronouncements and flowery news releases combined. One mistake properly handled can increase the pride of employees and the loyalty of current customers, and provide the organization with a competitive advantage when wooing new ones. 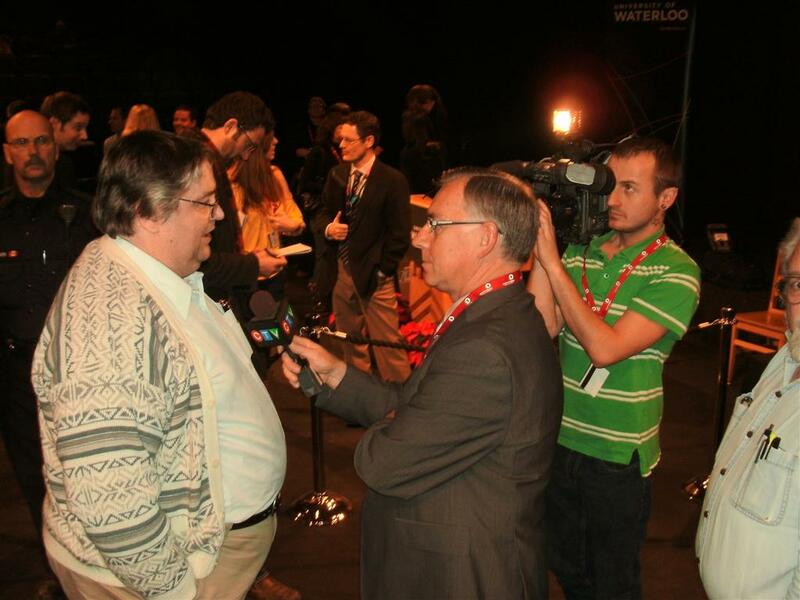 So, how did the University of Waterloo handle the national embarrassment that prevented one of Canada’s most respected journalists from speaking about Caledonia? 2. From the beginning Assistant Director of Media Relations Michael Strickland realized that we (Gary McHale and I) had an indirect – but important – stake in the issue, and a legitimate concern about the intimidation and accusations of racism directed at yet another person – this time an award-winning journalist – trying to tell the very story we have been trying to tell for four years. He treated our inquiries seriously and with respect. McHale, who writes a weekly column for Caledonia’s Regional News, sent Strickland a number of questions which he did his best to answer within the limits of his role as a representative of the university. Although some of the answers were less committal than McHale was hoping for (such as if and when any of the ‘protesters’ would be charged with a crime) Strickland replied promptly and courteously. When I contacted Strickland to advise him of our own experience at Mount Royal at the hands of radical ‘students’ supporting native extremists from Six Nations, he was also professional and understanding in a most genuine way. He didn’t try to brush me off, or distance himself. He made it clear – without taking sides on the issue – that he understood why I felt it was important to try to address for him the disgusting accusations of racism being made directly against Christie Blatchford and, indirectly, against us. He also invited me to come to the yet-to-be-scheduled event. 3. When Blatchford’s new date was announced Nov 23/10, I did, indeed, receive the promised invitation in the form of a news release [PDF] which was emailed to me. Since I live in London I asked Strickland if he could put aside two tickets for my wife and me so as to avoid the 3 hour round trip – he did so gladly. 4. On the evening of the presentation, security was very tight with a strong police presence, but not stiflingly so. Strickland made us feel welcome and promised to make himself available for a few minutes after the event to chat. 5. Bags and coats of attendees were checked and student volunteers were stationed in washrooms to ensure no fires were set. Despite my initial amusement at seeing a student with a fire extinguisher in his hands when I went to the washroom, I was advised that the possibility of arson by ‘student’ crazies was a legitimate concern. I had a conversation with a professor on the way out of the washroom who vented not only his disgust with the intimidation of Blatchford’s original event, but the necessity of having people stationed in the washroom in order to protect free speech at his university. Police had photos of potential disrupters and, according to the Record’s story, Dan Kellar was told he would be charged with trespassing if he tried to enter the premises. One indication that UW was following its security plans to the letter was Strickland’s relating to us of how he regretfully had to turn down a Caledonia resident (referenced in Helpless) who wanted tickets after sales were closed. 6. The university’s Dean of Arts – Ken Coates – explained to the near-sell out crowd, before introducing Blatchford, that anyone who disrupted the presentation would be asked to leave or be removed in the name of protecting the institution as a place where all ideas can be shared in the interest of academic freedom – including those opposed to the presenter. 7. The event, as stated, went off without a single glitch; the audience, including two occupation supporters who asked questions which Blatchford addressed in a thoughtful manner, were respectful. 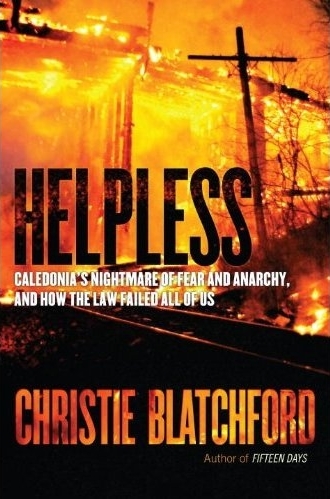 When question period was over people lined up, waiting for Christie’s pen to grace the title page of their copy of Helpless. 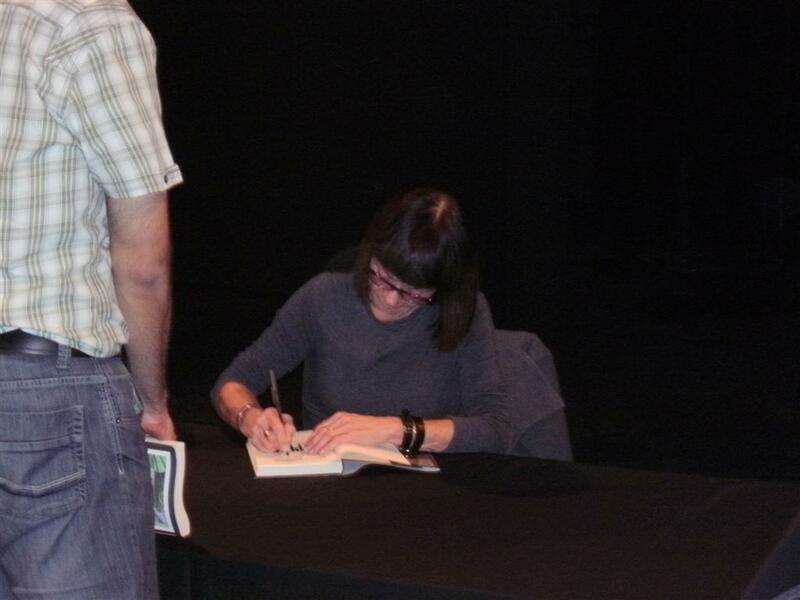 Some asked Gary McHale to autograph their copies as well and, with people waiting for their turn with Blatchford lined up on stage, CTV conducted a stand-up interview with him. 8. As the evening was drawing to a close, Michael Strickland gave Gary McHale and me a few minutes of his time to discuss the situation and to listen to my thoughts about the importance of getting Caledonia’s issues into the curriculum as a positive step toward furthering the healing process. He still wouldn’t answer McHale’s question, though, as to whether or not Kellar and crew would face charges. Mary Lou Ambrogio, VP of the Canadian chapter of the International Free Press Society was scheduled to accompany me to the event, but sickness forced her to reluctantly withdraw. 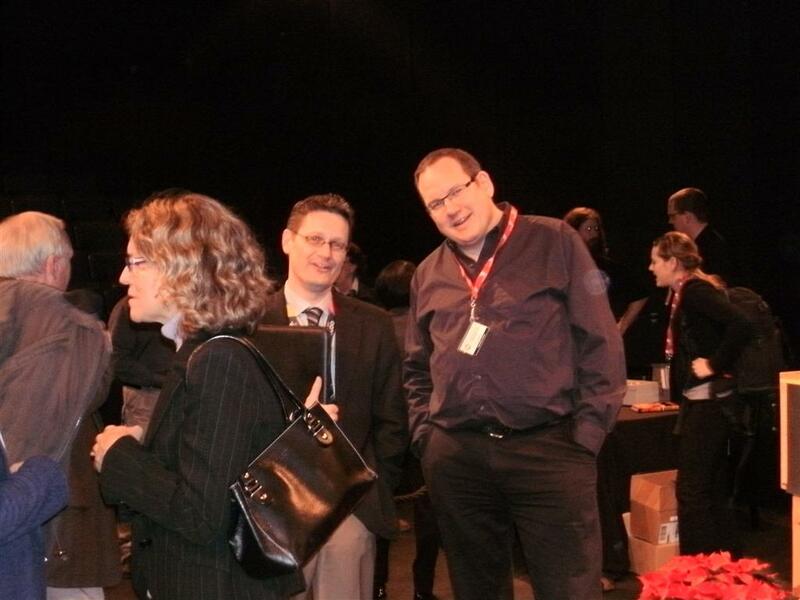 IFPS-Canada is the organization that brought Ann Coulter, Lars Vilks, and Philippe Karsenty (among others) to Canada, and have been watching the handling of the Blatchford incident closely. 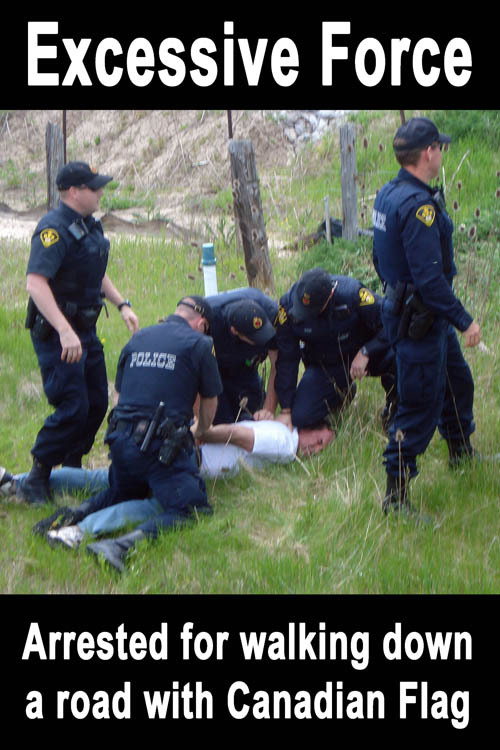 They have also taken an interest in how the OPP and anti-capitalists/anarchists supporting the lawlessness in Caledonia mounted character attacks on activists who spoke out against racial policing practices in order to discredit them. Coincidentally, on the same day as Blatchford’s presentation at UW, IFPS-Canada reprinted a Nov 03/10 editorial by Bill Jackson of Caledonia’s Regional News about his journalistic philosphy in covering the crisis, and his pride of being given a copy of Barb Patterson-Tuck’s painting ‘Caught in the Middle‘ by CANACE founders at the launch party for Helpless in honour of the Regional’s stand on the side of justice. It was clear during our discussion that Strickland had taken the time to understand both the issues of Caledonia and the people invested in speaking out for the victims, a hopeful sign indeed for the only university located within the Haldimand Tract. I can only hope that his efforts reflect a genuine interest on the part of the University of Waterloo to fulfil its moral obligation to become a leader in the study of Caledonia’s issues, and not merely a convenient cog in a public relations exercise. 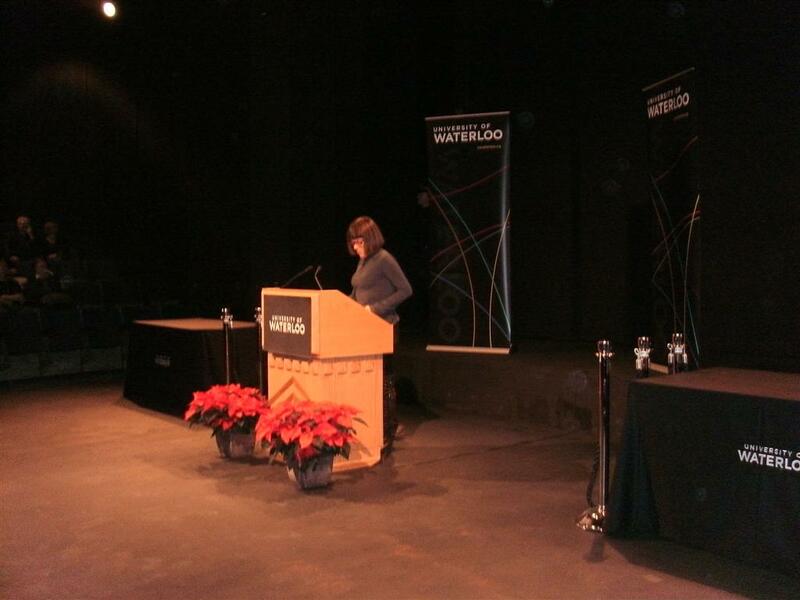 I think the best indication that Strickland and the University of Waterloo were not merely running a PR campaign (aside from the fact that they took a strong stand to protect the right of students and the public to hear what Blatchford had to say) was his statement to McHale and me that he had read Helpless three times. This caught me by surprise as did his depth of knowledge about us. When I mentioned the fact that native people were also victims of racial policing in Caledonia, he knew our position on the issue because he had reviewed at our presentations to Mount Royal University – among other things. When I expressed my astonishment at his research, Strickland explained that he wanted to know who was coming to his university. How much is Freedom of Expression worth? 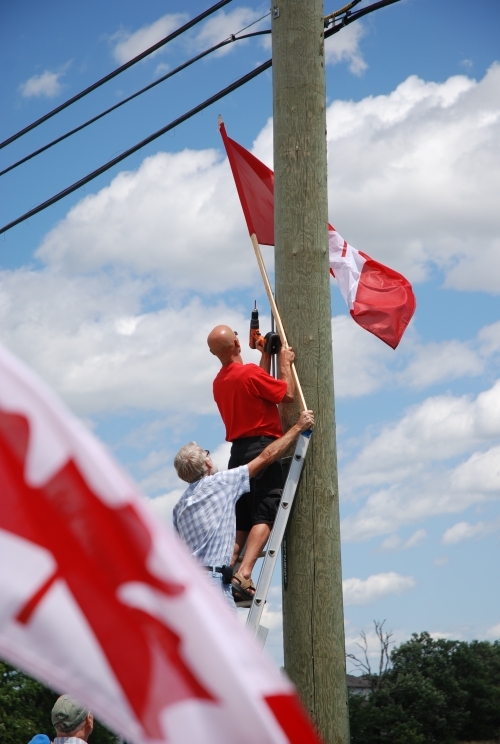 Since the person asking the question was there on July 12/09 when we finally forced the OPP to respect our right to raise a Canadian flag after a 31 month campaign, I reminded them how happy we would have been if the OPP had called out hundreds of officers, a helicopter and the London riot squad to protect Caledonia from the lawlessness, and to protect our right to walk down the street in Caledonia with Canadian flags instead of using these such overwhelming resources of the state to violate our rights. VoiceofCanada, July 12/10: THE END OF THE BEGINNING! I gave a speech before our May 24/09 March for Freedom which I entitled ‘Provoking Violence? Lessons From Dr. King and the Little Rock Nine‘ in which I spoke about the startling contrast between Ontario’s use of state resources to suppress civil rights of non-natives and President Eisenhower’s calling up of the 101st Airborne Division of the U.S. Army on Sept 25/57 to protect the right of nine black children – who would come to be known as the Little Rock Nine – to go to a white school in Arkansa. Eisenhower realized that the Constitution and the law had to be defended no matter the price. 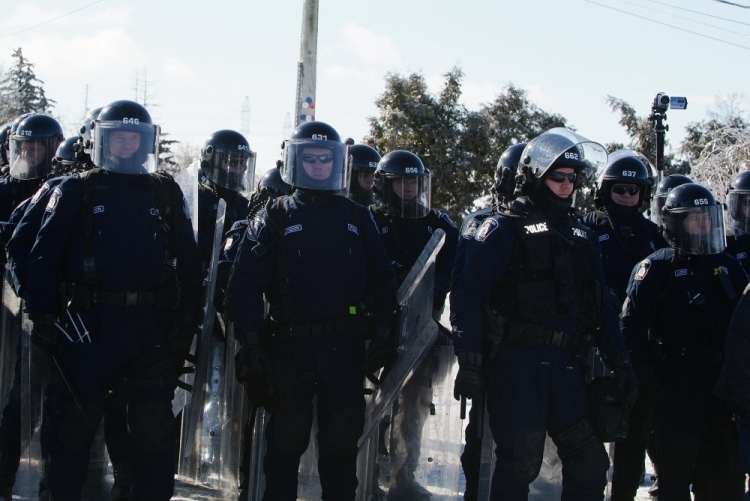 On Tuesday, December 07, 2010 the University of Waterloo did what it had to do – in a way, calling out its own lesser, but no less important version of Eisenhower’s 101st Airborne – to protect free speech and academic freedom in its university. It was no less heroic, at least in the eyes of this activist who was one of the four Canadians arrested for wanting to raise a Canadian flag in Caledonia by police who had the effrontery to tell the Ontario Human Rights Commission (case pending) in their defence they were simply protecting me and my followers from harm by an “extreme element” who might want to hurt us if we were allowed to place a Canadian flag on a hydro pole. How dearly I would have loved to have seen the OPP’s helicopter, their hundreds of officers, and the London Police riot squad called in to protect our rights instead of being used to appease native thugs who would have found fine company in 1957 Little Rock with the racists who didn’t want black children in their white school. 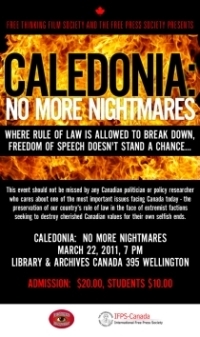 Even if Caledonia never makes it into its curriculum no one can deny that, despite its initial mis-step in allowing itself to be intimidated into cancelling Christie Blatchford’s first Helpless presentation, the University of Waterloo recovered admirably and did what it had to do to defend free speech in accordance with its stated values and that Canada is better because of it. In the four years Gary McHale and I have been working on the issue this is the first time that any institution has willingly, deliberately and decisively used the full weight of the law to defend the right of Caledonia’s victims to be heard. Michael Strickland and the University of Waterloo conducted a brilliant public relations campaign, but it is a pleasure to note that this was the least of their accomplishments. I give UW an ‘A-‘ grade for the handling of the Blatchford incident, but I will gladly promote it to ‘A+’ if it lays even one charge against any of those responsible for forcing taxpayers, students and parents to bear the cost of standing up to their attack on free speech and the rule of law. I must apologize for not being able to post this sooner; I was (am) coping with some persistent illness and a hectic schedule that included a one hour appearance with Gary McHale on CHRW Radio 94.9FM at the University of Western Ontario on Thursday as well as some non-Caledonia-related commitments. [LINK]. This entry was posted in Christie Blatchford, Helpless, Helpless - News, University of Waterloo and tagged Academic Freedom, Free speech on Universities. Bookmark the permalink.